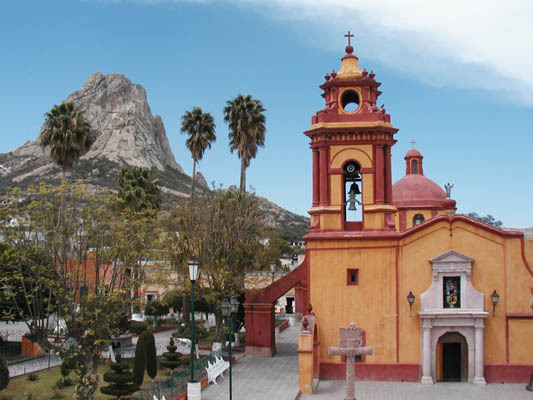 We have rented a little house in Bernal, Mexico, a town best known for the magnificent solid rock outcropping that serves as its backdrop. People come from all over the region to climb “La Pena”, absorb its beneficent energies, and buy the well-crafted woolen goods that can be found in many of the local shops. Our house is located just a few short blocks from the main downtown plaza and has excellent views of la Pena and the surrounding countryside. 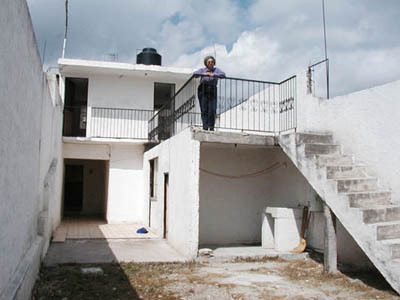 The rent is cheap enough that we can afford to experiment with living here for awhile. Even though this mode of living can work in such a moderate climate, it does mean that the inhabitants are exposed to certain extremes of temperature, and weather (wind and rain), when going from room to room. Rosana and I are accustomed to a more controlled indoor environment, that places us in comfortable surroundings most of the time. As soon as we rented the space, I began conceiving of ways to make it all much more comfortable, over the course of all of the seasons. 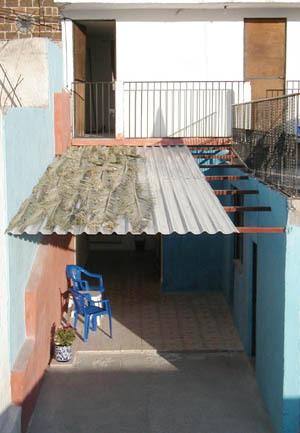 One obvious improvement would be to enclose the main open courtyard with a roof and end wall in such a way that it could collect solar heat and retain it when the weather is cold, and also shade and provide good ventilation when it is hot. I came up with the notion that if we roofed the area with a translucent material we could collect the solar heat when we wanted, and then cover the roof with something to provide shade the rest of the time. I immediately thought of using large-diameter bamboo as rafters to support such a roof, and asked around regarding availability. I know these grow along the coast and are sold there, but was disappointed to find that they are not available locally. Construction material yards, all across Mexico, tend to carry the same materials: cement, steel, bricks, tile, and some wood for the most part. So my next choice was dimensional lumber, but it needed to be at least 3 meters long to reach from one wall to the next. I stopped at several lumber yards and was astonished to learn that the only lumber available over 2 ½ meters long are huge vigas. I finally settled on extruded steel tubing with a rectangular cross section of about 1”X2”, which came in 6 meter lengths and was sold by the kilo. These could be cut in half and they worked out perfectly to frame the roof supports. In fact I simple cut the ends with a hacksaw in such a way as to produce flanges that I could fasten directly to the cement walls with screws and anchors. Since there is no snow load, and the roof is somewhat protected from the wind, I was able to place the rafters at about 3 ½ foot intervals. The translucent fiberglass roofing itself we managed to bring home strapped to the top of our little RV. 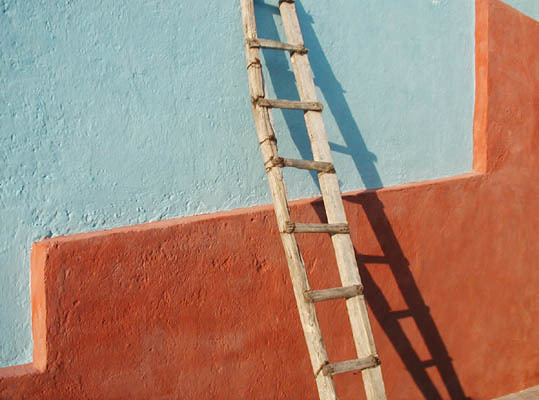 Once home, I fastened the roof to the rafters by standing on a ladder and reaching over one course at a time, since standing on the roof was not practical. For shade material I thought of rolls of shade cloth , and this could be a good option…but I really wanted something more natural and organic to contrast with all of the industrial stuff. Palm fronds that are often used for shade structures in Mexico occurred to me…but where could I find them? Almost as soon as I pondered this question the answer appeared. The equinox, which leads to Easter and Palm Sunday was underway in Bernal, where thousands of people from all over the Republic arrive to celebrate. In preparation for all this, the local churches and stage areas were festooned with palm fronds. After the celebrations I carefully asked the officials if I might gather and recycle the discarded fronds for a shade structure. They were happy to let me carry off what to them was trash, so within a few days I had a big pile of palm fronds to cover my new roof! 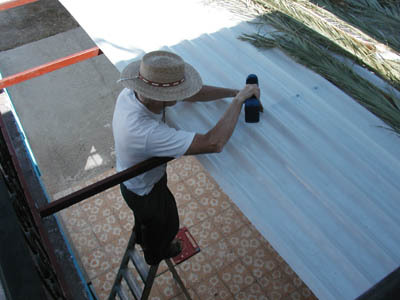 As I constructed the patio roof I simply laid the fronds in the corrugated troughs of the roofing, and layered them in such a way that they sort of interlock. I did this sequentially, as the roof took shape. My idea is that the palm fronds will be easy to set aside during the colder season to allow sunlight to enter the patio. 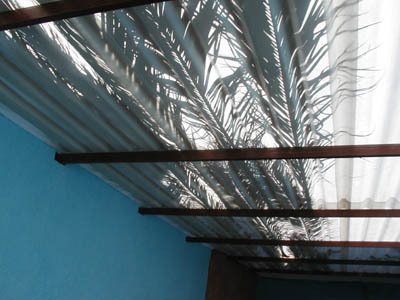 An added benefit of using the fronds is that they cast a marvelous shadow on the translucent roofing when viewed from below. The finished roof has been up for a while now, and there is already a huge difference in the feeling and comfort level of the space. The patio is now a room that is inviting to spend time in, whereas before it was glaring and hot much of the day. And of course now one can walk from room to room on the first floor without getting wet when it rains. Another aspect of transforming the space has been painting the stuccoed and white-washed walls with darker colors, for contrast, color, and to diminish the glare in the sunlight. We used ordinary hydrated lime (available from the manufacturing plant a few miles away) and mixed it with water, latex, and cement pigments to color it. We chose a pastel blue and a red oxide to contrast with the parts that remained white. The combination of this painting and the new roof has vastly transformed the whole function and appearance of this little house. Now I am about to install an old steel-framed door and window unit that our landlord had stored in his yard. This will totally enclose the space in such a way that the indoor/outdoor feeling will be retained, but we will have control over the climate of the indoor space. I guess we are true Gringos in this regard! congratulations! your house is looking beautiful! !